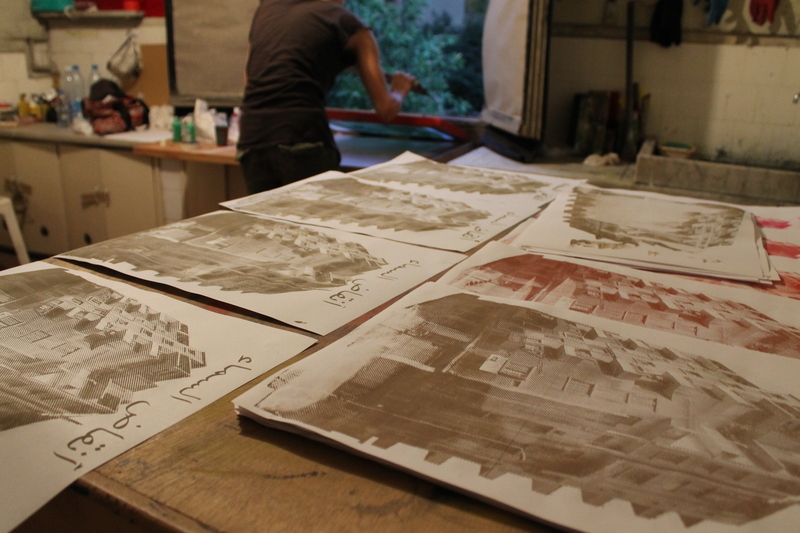 As soon as I arrived in Lebanon, I started looking for a silkscreen printing atelier. This technique is based on the method of stencil which uses a synthetic mesh (previously made of silk) to transfer ink on a substrate. I soon realized that most designers are having their prints done by professional/commercial craftsmen. In my opinion however, the most important part of the creative process occurs during the successive preparative and printing steps. This prompted me to focus my search on a space where I could carry out all steps myself. Several months later, I discovered Mansion, a non-profit, independently financed, alternative space of artistic production in the Zokak el Blatt neighborhood of Beirut. Here, I was offered the use of a very small room, a former kitchen of this old Ottoman villa, previously used as printing room. Ghassan Masri, co-founder of Mansion, gave me the key of the house and told me I was free to use the printing room. 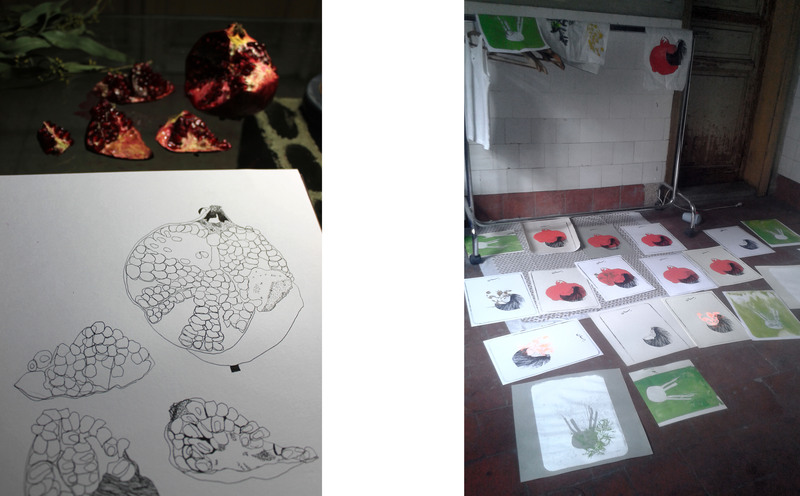 The space was not equipped with the usual tools for drying, insulating, and washing screens, but I used the lack of equipment as an opportunity to develop a specific way to print. In fact, I then spent almost two months testing and experimenting with photo reactive chemicals, a strong light to insulate the drawings and some very old frames to finally reach the level of fineness I needed. 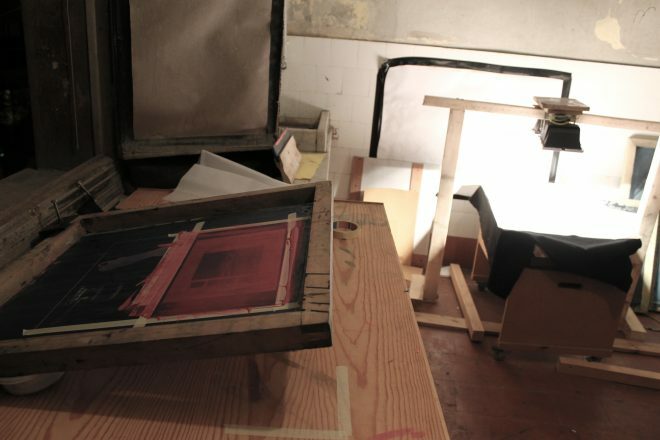 Silkscreen printing can serve as a highly industrial and efficient technique but an artist can also create his/her own specific method, even with very basic tools. There is not one single way of working with silkscreen. I decided to relearn the process and developed a technique that suited the graphical research I wished to pursue. I created my own manual process adapting itself to the needs of each projects. Being able to do everything myself gave me a lot of freedom to obtain a specific result. A manual process turns silkscreen into an art in its own right, instead of a mere technique to reproduce a previously planned design. The final graphic becomes the product of a manual construction, versus a virtualization and de-materialization of an image. I start with my own original illustrations after which the way of insulation I choose will influence how the illustration will appear on the mesh. In other words, it determines how fine and detailed the stencil will appear on the mesh. I am able to use a wide range of colors since I mix them myself and create an infinite variation of prints by playing with a countless overlapping and repetitions of layers of the same illustration. In a context where the tendency is to have production made by others, it was a challenge to develop an entirely handmade technique. 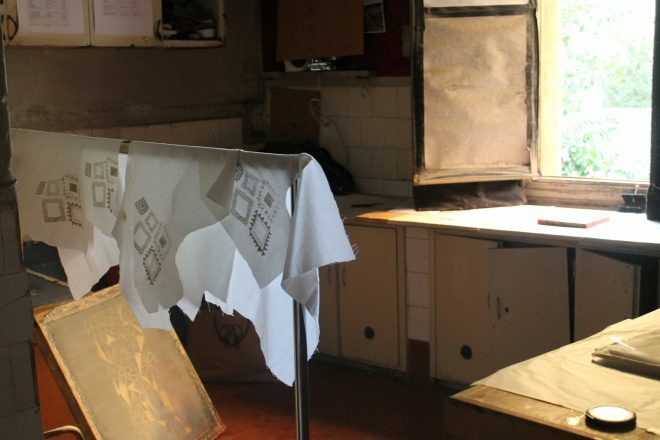 Basic silkscreen printing is taught at several Beirut universities in well-equipped studios. This however does not help students acquire a sense of handmade craft. For approximately a year, with the help of two designers, I strived to build a small community of artists interested in experimenting with manual processes at the atelier and in promoting hand crafted works of art among young designers. The atelier is independently financed through musical events at Mansion along with printing workshops organized in the atelier itself. My work is supported by a chain of local craftsmen who contribute their savoir-faire and take an active part in the creative process. My work’s concept is based less on the idea of producing a given final product and more on an inspiration, a feeling that I want to express, an atmosphere which is translated into the end product. My research focuses more on the methodology and the philosophy of design than on the outcome. 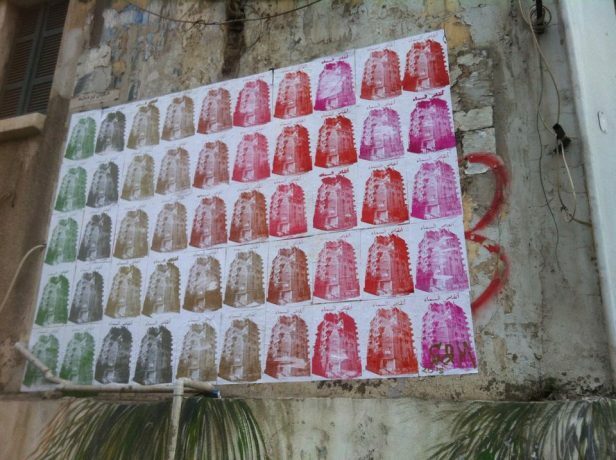 During the Artisan Market 2015 in Saifi village in Beirut downtown, I decided to print a part of my products live, to share the process of printing and let it be influenced by any curious passer-by. I am currently developing a research on the representation/image of the region’s botanical heritage and I am working together with the Sursock museum in Beirut on re-discovering photographical archives throughout silkscreen print. Soraya Ghezelbash (born 1985) is a French-Iranian architect & artist based in Beirut working with a broad range of media including silkscreen, drawing and installations. She received a master in architecture with distinction from the school La Cambre in Brussels, Belgium and broaden the scope of the discipline while being part of Partizan Publik ( PP is a team of social engineers that produce public equity through research, design and communication.) in Amsterdam, The Netherlands. After working between 2012 and 2014 on large scale art installations for the artist Nadim Karam, she decides to focus on public space art interventions and silkscreen. 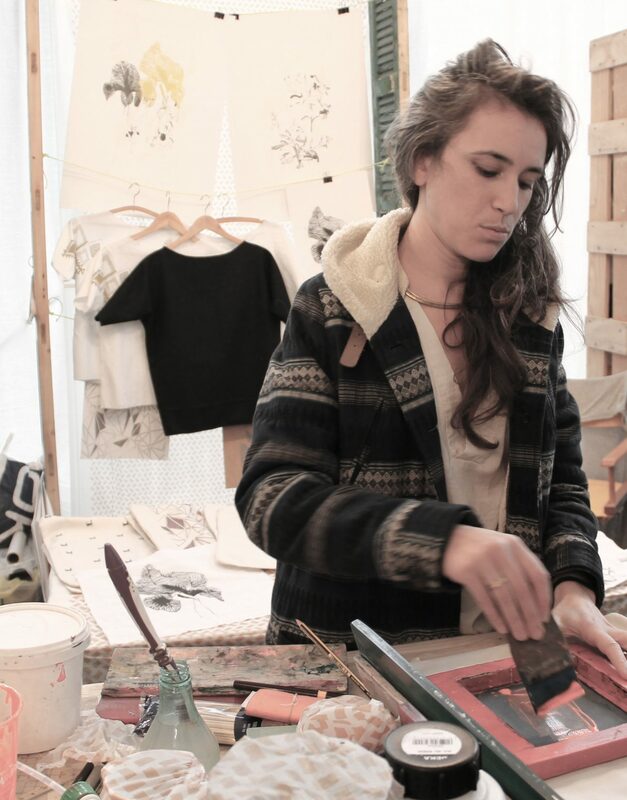 She is co-running the silkscreen atelier Silkroad part of Mansion (Mansion is a non-profit, self-financed alternative space of artistic production in Zokak el Blatt, Beirut.). Her work focuses on oppression / tension of spaces, the right to the city but also ironical scenery of daily life as a never-ending spectacle. More recently she is developing a graphical study on endemic flora to Lebanon as the starting point of a research on the consequences of colonialism on the botanical heritage of a region. Soraya Ghezelbash is also co-founder of Shadows, a group of architects making a series of interventions in the public realm of Beirut that generate alternative scenarios for neglected & prohibited spaces.